The cheese ball. What a great concept…a ball of cheese. Who wouldn’t want to eat that? It’s one of those appetizers that’s always present at family gatherings in the South, especially around the holidays. I’ve seen savory cheese balls and sweet cheese balls. There’s a variety of different recipes out there, but this one comes from Mama with a few of my own touches. 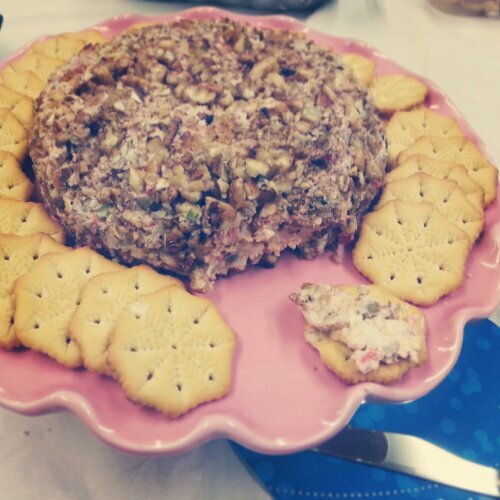 I contributed this cheese ball to my office Christmas party and it was a hit! It has pops of red and green color for the holidays, and it’s versatile. You can add or take away whatever flavors you like. Spreadable and creamy, this cheese ball has crunch and sweet heat. It’s cold and satisfying. The cheese ball comes together quickly and is edible right away, but has a more firm texture when chilled. I recommend making it a day ahead and letting it set up in the fridge overnight. If you’re short on time, 30 minutes to an hour will do. Dry roast pecans in a saute pan over medium heat, flipping occasionally until fragrant and golden (5-10 minutes). Set aside. Using a hand mixer, blend the cheeses together until incorporated. Add in remaining ingredients, reserving the pecans for the outside, and season with seasoned salt and pepper. Blend on low-speed until everything is incorporated. Turn the mixture out onto plastic wrap and form it into a ball. Remove the plastic wrap and roll the ball in the chopped pecans until covered. Let chill. Serve with buttery crackers, like Ritz, toasted bread or even Scoops tortilla chips. Note: If you’re using a food processor to chop your onion and bell pepper, be sure to drain any natural water from the vegetables before adding them to the mixture. Additional water will make your cheese ball runny, and you wouldn’t want that. 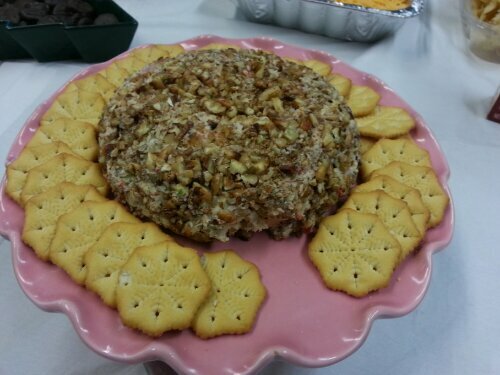 Serve the cheese ball on a round dish if you have one! It enhances the natural shape of the appetizer and is fun to surround with crackers. Presentation is everything! I served the cheese ball with snowflake-shaped crackers for a little Christmas cheer, but this recipe is wonderful year around with whatever kind of crackers you like. Enjoy!